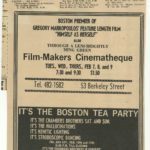 The Cinematheque and the Tea Party were founded and run by a controversial figure named Mel Lyman, a harmonica player and the leader of a hippie commune in Boston’s Fort Hill neighborhood. Lyman has also been considered a cult leader on par with Charles Manson, except Lyman’s followers never actually murdered anyone. 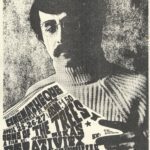 According to the book Apocalypse Culture, Lyman claimed to be an extraterrestrial and was seemingly obsessed with “ruling” the country’s underground culture. 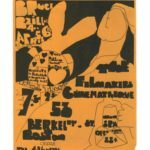 Whatever Lyman’s background, the Cinematheque showed some cool films, according to the actual flyers from that time period below. Click each poster to embiggen; or you can also click through the gallery at the very bottom of this article. 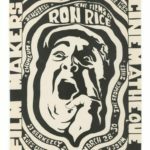 While the Boston Cinematheque was open for two years, all of the posters below are from 1967. 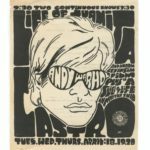 Andy Warhol was a semi-regular figure at the Boston Cinematheque, both for screenings of his films and for performances with the Velvet Underground at the Tea Party. 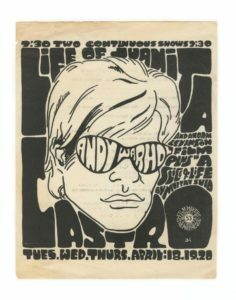 On April 18-20, 1967, the Cinematheque screened Warhol’s The Life of Juanita Castro (1965), which starred fellow underground filmmaker Marie Menken in the title role and was one of Warhol’s collaborations with the screenwriter Ronald Tavel. The film was screened along with an untitled film by Norm Levinson; and A Slice of Life by Murray Suid. 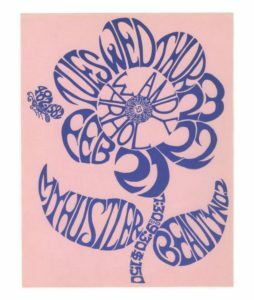 Warhol previously screened two films at the Cinematheque on February 21-23, 1967: My Hustler and Beauty No. 2. According to J.J. Murphy’s The Black Hole of the Camera — the definitive book on the films of Andy Warhol — Beauty #2 (as it’s typically referred to) stars Edie Sedgwick and Gino Piserchio sitting on a bed together while Sedgwick’s ex-boyfriend Chuck Wein taunts them from off-screen. 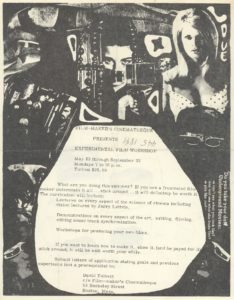 My Hustler was conceived by Warhol and Wein and was largely improvised by its cast that includes Paul America, Joe Campbell, Ed Hood, Genevieve Charbin and Dorothy Dean, who financed the film. It’s also worth noting that the above Warhol films were all completed in 1965, but screened in Boston two years later. 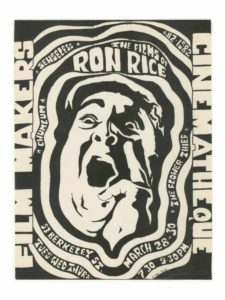 That also goes for a retrospective of films by Ron Rice that screened on March 28-30, 1967. 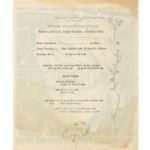 Rice tragically had passed away in 1964, but for this event the Cinematheque screened The Flower Thief (1960), Senseless (1962) and Chumlum (1964). Chumlum was preserved by the Anthology Film Archives and can be found on the Treasures IV DVD box set. The last poster from the Sotheby’s collection is for films by Bruce Baillie that screened on April 4-6, 1967. Included in the screening were Tung (1966), Yellow Horse (1966), Castro St. (1966), Quixote (1965), To Parsifal (1963), A Hurrah for Soldiers (1963), and, allegedly “many more.” Interestingly, this poster differs greatly in style from the ones posted above — It’s way less psychedelic and detailed. Also, A Hurrah for Soldiers is listed as just A Hurrah, perhaps for space reasons. You can watch the masterful Quixote on the Journal here. 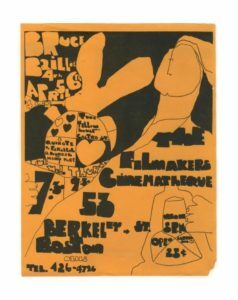 This next batch of Boston Cinematheque posters comes from the Flickr account of Wilson Bilkovich, whose connection to underground film the Journal is not sure of. We are posting these, for the most part, in chronological order of the screenings. 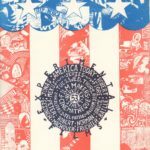 While it seems most of these posters promote either the work of specific filmmakers or just specific films, from January 31 to February 2, 1967, the Cinematheque presented the “America Today Series” that screened work from multiple filmmakers, including Robert Fiore, Bruce Baillie, Norman Fruchter, Robert Machover, Peter Gessner and Jonas Mekas. (The poster incorrectly spells Mekas’s name as “Jonas Mekus”.) Mekas, of course, ran the New York Cinematheque at its various locations throughout the 1960s. 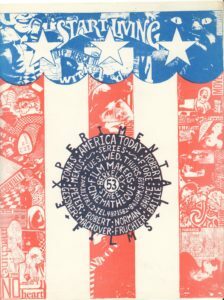 While it is unknown what films actually screened in this series, according to the Film-makers’ Coop catalog, Fruchter and Machover collaborated on the 1966 documentary Troublemakers, about community organizing in Newark; while Gessner compiled a found footage film about the Vietnam war in 1966 called Time of the Locust. It’s also unknown if the Robert Fiore named on the poster is the same Fiore who later co-directed the Arnold Schwarzenegger documentary Pumping Iron. 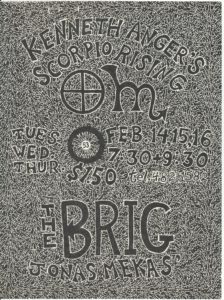 Two weeks later on February 14-16, 1967, the Cinematheque screened another film by Jonas Mekas, The Brig (1964), which played on a double-bill with Kenneth Anger‘s Scorpio Rising (1963). The Brig is available for viewing on Amazon. 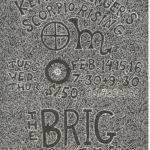 You can watch Scorpio Rising here; or on Fantomas’s Complete Magick Lantern Cycle DVD set. 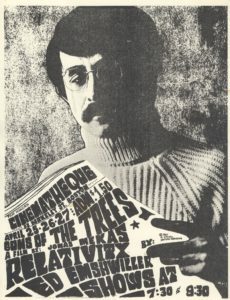 As mentioned above, below is the poster for the April 25-27, 1967 screening of Jonas Mekas‘s Guns of the Trees (1961), that played with Ed Emshwiller‘s Relativity (1966). 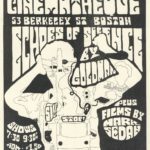 Interestingly, you may note, Guns of the Trees was completed three years before The Brig, but the Boston Cinematheque screened the latter film first. You can watch Guns of the Trees on Vimeo. Relativity was the film Emshwiller made with the money he received from a Ford Foundation Grant in 1964. 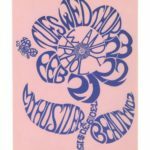 Later, according to the book Sydney Underground Movies, Relativity would win a Special Diploma at the 1968 Oberhausen Experimental Film Festival and was banned from screening in Australia. 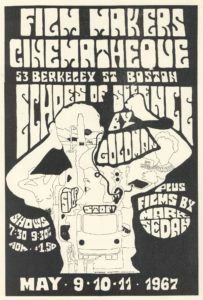 The next month on May 9-11, 1967, the Cinematheque screened Peter Emanuel Goldman’s Echoes of Silence (1965); plus films by Mark Sedak. 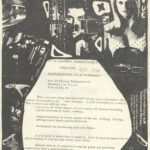 Echoes of Silence was Goldman’s first feature film that previously screened at the New York Cinematheque on February 15, 1965, according to Jonas Mekas’s Movie Journal, and you can watch it now on Vimeo. As of this writing, the Journal has no information about Sedak. 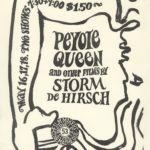 Our last poster in this article promotes a screening on May 16-18, 1967 of the films of Storm de Hirsch, including her most well-known work Peyote Queen (1965), which is also available on the Treasures IV DVD set. Although there are no more posters in this series, there are two “bonus” materials, also from Bilkovich’s collection. 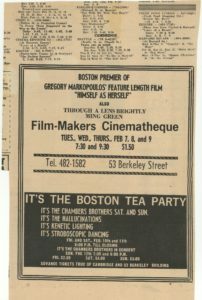 The first is a newspaper ad promoting the Boston premiere of Gregory Markopoulos‘s feature film Himself as Herself (1966), which was accompanied by two of Markopoulos’s short films, Through a Lens Brightly: Mark Turbyfill (1967) and Ming Green (1966). According to Mekas’s Movie Journal, Himself as Herself was shot in 1964 in Boston. 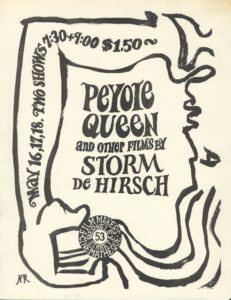 Lastly, here’s the final poster from the Cinematheque, which is not for a screening, but for an Experimental Film Workshop that ran from May 22 to September 22, 1967. The point of contact for the Workshop is listed as David Tulbert. 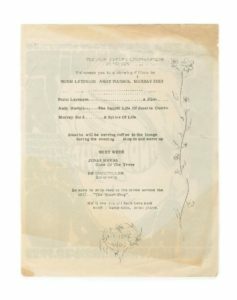 The other name listed is Jerry Lettvin, who gave “vision lectures.” While nothing is known of Tulbert as of this writing, “Jerry” Lettvin may be the late cognitive scientist Jerome Lettvin, who taught at the Massachusetts Institute of Technology (MIT) at that time.